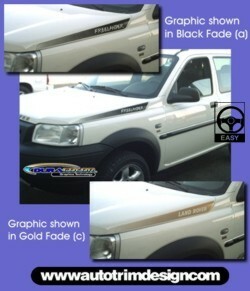 Make your Land Rover Freelander unique with this hood side graphics kit. Available in one of two (2) designations and one of three (3) different color schemes - Black, Silver or Gold. Each graphic is packaged with one (1) Driver Side and one (1) Passenger side graphic. Looks great and easy to follow online application and care instructions are included.